The Church Council of 1267. Capital of Austria-Hungary. Legend asserts that Jews settled in this city in the remotest antiquity, and it is alleged that some were among the first colonists that Rome sent to the Danube. 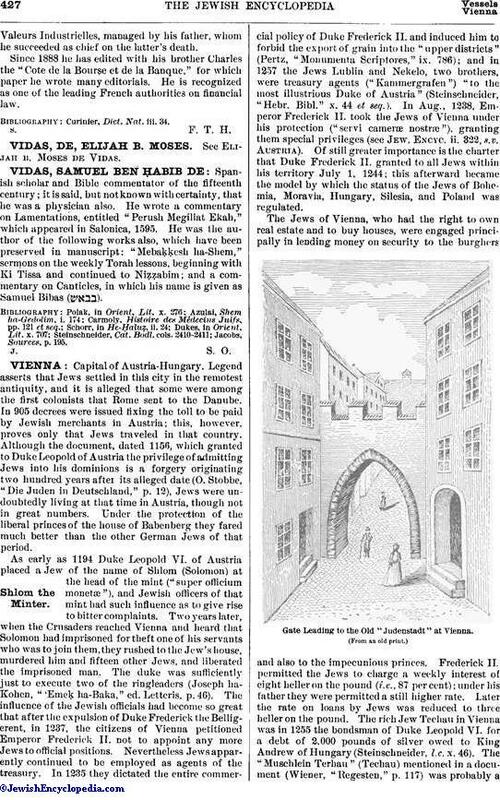 In 905 decrees were issued fixing the toll to be paid by Jewish merchants in Austria; this, however, proves only that Jews traveled in that country. Although the document, dated 1156, which granted to Duke Leopold of Austria the privilege of admitting Jews into his dominions is a forgery originating two hundred years after its alleged date (O. Stobbe, "Die Juden in Deutschland," p. 12), Jews were undoubtedly living at that time in Austria, though not in great numbers. Under the protection of the liberal princes of the house of Babenberg they fared much better than the other German Jews of that period. As early as 1194 Duke Leopold VI. of Austria placed a Jew of the name of Shlom (Solomon) at the head of the mint ("super officium monetæ"), and Jewish officers of that mint had such influence as to give rise to bitter complaints. Two years later, when the Crusaders reached Vienna and heard that Solomon had imprisoned for theft one of his servants who was to join them, they rushed to the Jew's house, murdered him and fifteen other Jews, and liberated the imprisoned man. The duke was sufficiently just to execute two of the ringleaders (Joseph ha-Kohen, "'Emeḳ ha-Baka," ed. Letteris, p. 46). The influence of the Jewish officials had become so great that after the expulsion of Duke Frederick the Belligerent, in 1237, the citizens of Vienna petitioned Emperor Frederick II. not to appoint any more Jews to official positions. Nevertheless Jews apparently continued to be employed as agents of the treasury. In 1235 they dictated the entire commercial policy of Duke Frederick II. and induced him to forbid the export of grain into the "upper districts" (Pertz, "Monumenta Scriptores," ix. 786); and in 1257 the Jews Lublin and Nekelo, two brothers, were treasury agents ("Kammergrafen") "to the most illustrious Duke of Austria" (Steinschneider, "Hebr. Bibl." x. 44 et seq.). In Aug., 1238, Emperor Frederick II. took the Jews of Vienna under his protection ("servi cameræ nostræ"), granting them special privileges (see Jew. Encyc. ii. 322, s.v. Austria). Of still greater importance is the charter that Duke Frederick II. granted to all Jews within his territory July 1, 1244; this afterward became the model by which the status of the Jews of Bohemia, Moravia, Hungary, Silesia, and Poland was regulated. 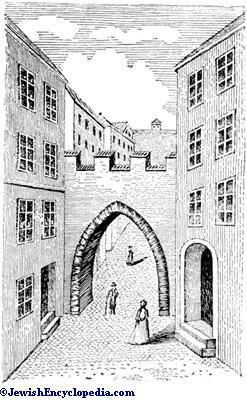 Gate Leading to the Old "Judenstadt" at Vienna. The Jews of Vienna, who had the right to own real estate and to buy houses, were engaged principally in lending money on security to the burghers and also to the impecunious princes. Frederick II. permitted the Jews to charge a weekly interest of eight heller on the pound (i.e., 87 per cent); under his father they were permitted a still higher rate. Later the rate on loans by Jews was reduced to three heller on the pound. The rich Jew Techau in Vienna was in 1255 the bondsman of Duke Leopold VI. for a debt of 2,000 pounds of silver owed to King Andrew of Hungary (Steinschneider, l.c. x. 46). The "Muschlein Terhau" (Techau) mentioned in a document (Wiener, "Regesten," p. 117) was probably ason of this otherwise unknown person. The favorable position of the Jews changed when, in May, 1267, the Council of Vienna revived the ancient ecclesiastical decrees concerning the Jews. These decrees fostered hatred against the Jews, but they could not be carried out to the letter, since the princes in their monetary difficulties could not get along without Jewish help. Emperor Rudolph, the first of the house of Hapsburg, who was indebted to a Jew by the name of Amschel Oppenheimer, confirmed in 1277 the Jews' statute of Duke Frederick the Belligerent; but a year later he declared the Jews ineligible for public office, a privilege which his successor, Duke Albert, confirmed to the citizens of Vienna in 1296. The fourteenth century in general brought much misery to the Jews of Vienna. In 1337 outrages were committed against them, but Duke Albert and the nobles interfered to protect them from further injustice. In recognition of the good-will shown by the citizens of Vienna in time of distress, and in anticipation of its continuance, the Jews declared, in a document written in Hebrew and dated Vienna, June 19, 1338, that they would lend to the citizens of Vienna, rich as well as poor, a pound of Vienna heller at a weekly interest of three heller. On the following day appeared the "Jews' decree" of the dukes Albert and Otto, and the endorsement of the Jewish document (G. Wolf, "Gesch. der Juden in Wien," p. 11; idem, "Studien zur Jubelfeier der Wiener Universität," pp. 170 et seq. ; Wiener, l.c. p. 221). 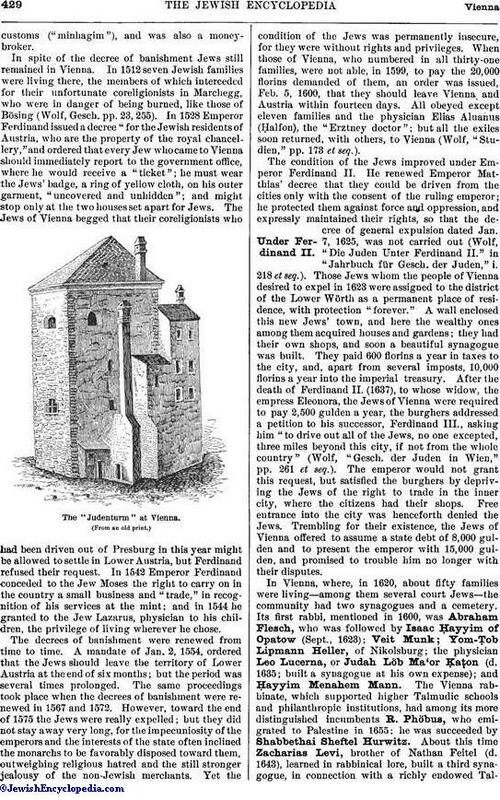 The Jews of Vienna appear to have suffered during the persecutions consequent on the Black Death (1369), and in 1370 they were seized, deprived of their possessions, and expelled from the city. But in spite of these persecutions the Jews very soon returned to Vienna and other places. The dukes Albert and Leopold, who were continually in financial straits, needed the Jews, as did also their successors. At their pleasure they "killed the Jews' letters," that is, they canceled the debts of the burghers to the Jews, often those of an entire city. One of the richest Jews of Vienna, called in the documents indifferently David the Steuzz, Von Steuzz, Steuzzel, or Steuzzlein (the Jew Hennlein von Neuenburg's son), who from 1350 to 1386 had business relations with the nobles and the burghers, often lent large sums to Duke Albert; and after his (Steuzz's) death his son Jonah entered upon his rights; only the duke himself could bring an action against him (Wiener, l.c. pp. 224 et seq. ; according to Document No. 169 [p. 240] he should be called "Jonah the Steussen" instead of "Jonah the Russian"). 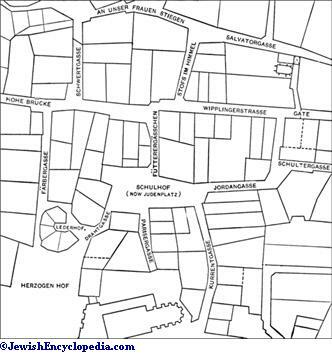 Plan of the Old "Judenstadt" at Vienna. In 1421 Duke Albert issued a decree that in future no Jew should be permitted to live in Austria; this decree was renewed by Duke Ladislaus in 1453 ("Monumenta Germaniæ," xi. 517; Wertheimer, "Die Juden in Oesterreich," i. 97; Wolf, Gesch., pp. 18 et seq. ; Wiener, l.c. p. 239; Joseph ha-Kohen, "'Emeḳ ha-Baka," p. 219; "Terumat ha-Deshen," responsa, No. 241). 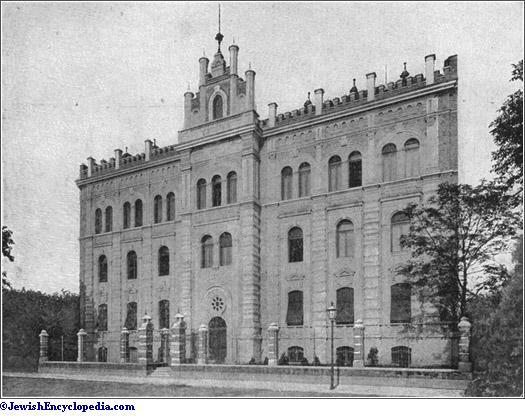 The houses of the Jews who had been burned or expelled were sold or given away by the duke, the synagogue at Tulln was presented to the convent of St. Dorothea in Vienna, and the synagogue at the latter place was torn down and the stones used for building a university. Notwithstanding these persecutions the spiritual activity of the Vienna Jews was considerable. One of the earliest rabbis of Vienna was Isaac b. Moses (called also Isaac "Or Zarua'," after the title of his work, or simply Isaac of Vienna). A ritual question was addressed to him in 1240 by Abigdor ha-Kohen, the son-in-law of the learned and rich Ḥayyim b. Moses of Wiener-Neustadt, who, together with his brother Eliezer, was at the head of the Viennese rabbinate. Another rabbi of Vienna was Meïr ha-Levi ben Baruch, who restored the rabbinical ordination. His son probably was the "Judenmeister," Baruch of Vienna, with whom, together with Meïr b. Baruch, who died about 1400, the dukes Albert and Leopold came to an agreement in regard to security for 20,000 gulden (Wiener, l.c. p. 228, No. 82). Abraham Klausner filled the Vienna rabbinate; the last - named collected the various synagogalcustoms ("minhagim"), and was also a money-broker. In spite of the decree of banishment Jews still remained in Vienna. In 1512 seven Jewish families were living there, the members of which interceded for their unfortunate coreligionists in Marchegg, who were in danger of being burned, like those of Bösing (Wolf, Gesch. pp.23, 255). In 1528 Emperor Ferdinand issued a decree "for the Jewish residents of Austria, who are the property of the royal chancellery," and ordered that every Jew who came to Vienna should immediately report to the government office, where he would receive a "ticket"; he must wear the Jews' badge, a ring of yellow cloth, on his outer garment, "uncovered and unhidden"; and might stop only at the two houses set apart for Jews. The Jews of Vienna begged that their coreligionists who had been driven out of Presburg in this year might be allowed to settle in Lower Austria, but Ferdinand refused their request. In 1542 Emperor Ferdinand conceded to the Jew Moses the right to carry on in the country a small business and "trade," in recognition of his services at the mint; and in 1544 he granted to the Jew Lazarus, physician to his children, the privilege of living wherever he chose. The decrees of banishment were renewed from time to time. A mandate of Jan. 2, 1554, ordered that the Jews should leave the territory of Lower Austria at the end of six months; but the period was several times prolonged. The same proceedings took place when the decrees of banishment were renewed in 1567 and 1572. However, toward the end of 1575 the Jews were really expelled; but they did not stay away very long, for the impecuniosity of the emperors and the interests of the state often inclined the monarchs to be favorably disposed toward them, outweighing religious hatred and the still stronger jealousy of the non-Jewish merchants. Yet the condition of the Jews was permanently insecure, for they were without rights and privileges. When those of Vienna, who numbered in all thirty-one families, were not able, in 1599, to pay the 20,000 florins demanded of them, an order was issued, Feb. 5, 1600, that they should leave Vienna and Austria within fourteen days. All obeyed except eleven families and the physician Elias Aluanus (Ḥalfon), the "Erztney doctor"; but all the exiles soon returned, with others, to Vienna (Wolf, "Studien," pp. 173 et seq.). The condition of the Jews improved under Emperor Ferdinand II. He renewed Emperor Matthias' decree that they could be driven from the cities only with the consent of the ruling emperor; he protected them against force and oppression, and expressly maintained their rights, so that the decree of general expulsion dated Jan. 7, 1625, was not carried out (Wolf, "Die Juden Unter Ferdinand II." in "Jahrbuch für Gesch. der Juden," i. 218 et seq.). Those Jews whom the people of Vienna desired to expel in 1623 were assigned to the district of the Lower Wörth as a permanent place of residence, with protection "forever." A wall enclosed this new Jews' town, and here the wealthy ones among them acquired houses and gardens; they had their own shops, and soon a beautiful synagogue was built. They paid 600 florins a year in taxes to the city, and, apart from several imposts, 10,000 florins a year into the imperial treasury. After the death of Ferdinand II. (1637), to whose widow, the empress Eleonora, the Jews of Vienna were required to pay 2,500 gulden a year, the burghers addressed a petition to his successor, Ferdinand III., asking him "to drive out all of the Jews, no one excepted, three miles beyond this city, if not from the whole country" (Wolf, "Gesch. der Juden in Wien," pp. 261 et seq.). The emperor would not grant this request, but satisfied the burghers by depriving the Jews of the right to trade in the inner city, where the citizens had their shops. Free entrance into the city was henceforth denied the Jews. Trembling for their existence, the Jews of Vienna offered to assume a state debt of 8,000 gulden and to present the emperor with 15,000 gulden, and promised to trouble him no longer with their disputes. 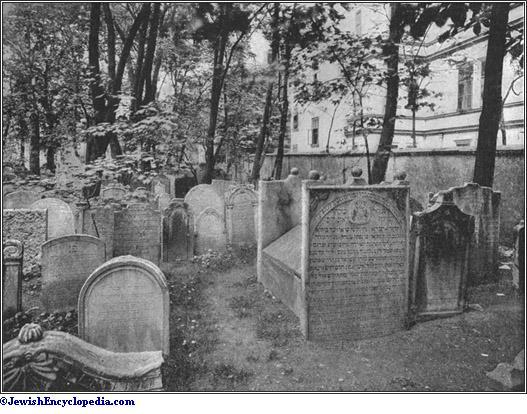 In Vienna, where, in 1620, about fifty families were living—among them several court Jews—the community had two synagogues and a cemetery. Its first rabbi, mentioned in 1600, was Abraham Flesch, who was followed by Isaac Ḥayyim of Opatow (Sept., 1623); Veit Munk; Yom-Ṭob Lipmann Heller, of Nikolsburg; the physician Leo Lucerna, or Judah Löb Ma'or Ḳaṭon (d. 1635; built a synagogue at his own expense); and Ḥayyim Menahem Mann. The Vienna rabbinate, which supported higher Talmudic schools and philanthropic institutions, had among its more distinguished incumbents R. Phöbus, who emigrated to Palestine in 1655; he was succeeded by Shabbethai Sheftel Hurwitz. About this time Zacharias Levi, brother of Nathan Feitel (d. 1643), learned in rabbinical lore, built a third synagogue, in connection with a richly endowed Talmudicschool, and Vienna became a center of Jewish learning and cabalistic speculation. The last rabbi of Vienna and of Lower Austria was Gershon Ashkenazi, whose colleagues were Mordecai Löb Oettingen (the friend of the Christian divine Wagenseil) and the preachers Uri Lipmann Hirz Koma and Enoch Fränkel. The Jewish community of Vienna in 1660 numbered about 500 families, and in spite of the many taxes, assessments, and war duties was in a flourishing condition. But troublous times were in store for it. The hatred of the burghers increased with their intolerance, leading to difficulties in which the government had to interfere. When in May, 1665, the body of a woman was found in a pool in the Jewry, the Jews were accused of having murdered her, and their lives were in jeopardy. Unfortunately for them, Emperor Leopold, who was entirely in the hands of the Jesuits, married a Spanish infanta. When the crown prince died, in Jan., 1668, three months after his birth, the emperor and empress formed the thought of dealing with the Jews in Spanish fashion. A fire happened to break out in the newly built royal palace in February of the same year, and the populace accused the Jews of having kindled it. In April, 1668, delegates of the city of Vienna appeared before the emperor, praying him to destroy the Jews "root and branch"; and before the end of the month outrages began against them. The riots turned into wholesale looting expeditions, and the students and the mob attempted to fire the ghetto. The military guard had to be called out; but it was only on the third day of the riot that the emperor gave orders that no non-Jew was to set foot in the Jewry. In further evidence of the desirability of banishing the Jews, they were accused of being in secret communication with the Swedes. It was finally decided, July 26, 1669, to expel a number of Jews from Vienna and Lower Austria; 1,346 persons were affected by this decree of banishment. In their dire need the Jews of Vienna once more sent a memorial to the emperor; but in vain, for the commission had attributed to them all kinds of crimes. Exterior of the Leopoldstrasse Synagogue, Vienna. (From a photograph. )Expulsion of 1670. 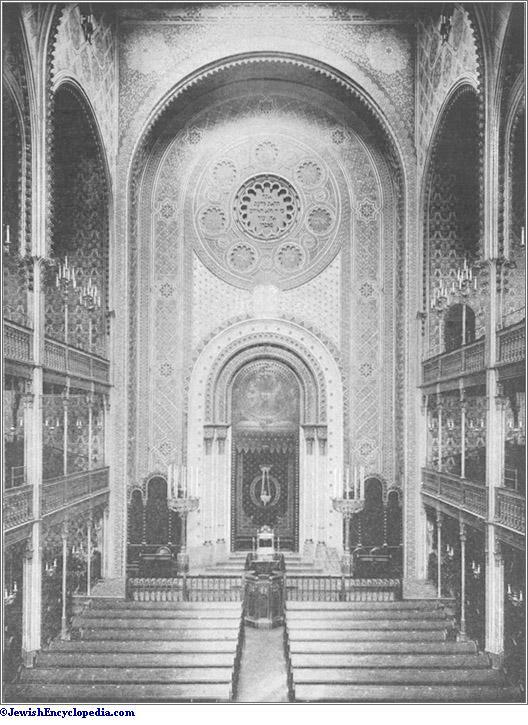 Interior of the Leopoldstrasse Synagogue, Vienna. On Monday, March 1, 1670, a solemn proclamation was made in all public places that "for the glory of God" all Jews should, on penalty of imprisonment and death, leave Vienna and Upper and Lower Austria before Corpus Christi Day, never to return. Hirz Koma and the physician of the community, Leo Winkler, in the name of the community made a last attempt to propitiate the emperor by offering him 100,000 florins and, in addition, 10,000 florins a year. In the meantime the period fixed for the exodus had been prolonged at the intercession of influential persons. In July the Jews began to leave, and by Aug. 1 not one Jew was left in Vienna. 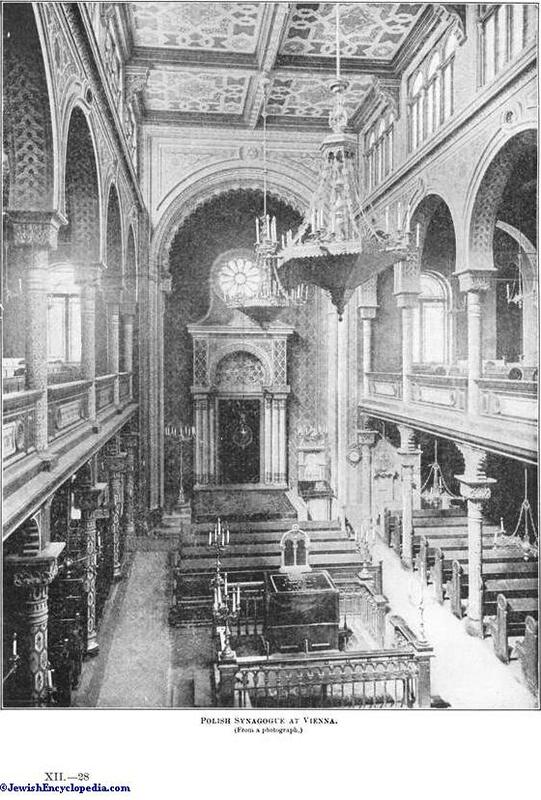 The cemetery in the Rossau was protected by the city in consideration of the sum of 4,000 florins; the houses of the Jews became the property of the city; the large new synagogue was turned into a church, renamed the Leopoldskirche, and solemnly consecrated on Aug. 18; a Jew's house was turned into the parsonage. 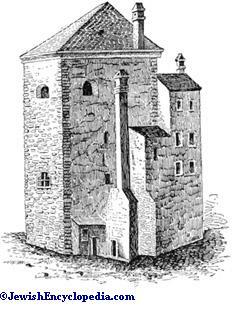 In place of the old synagogue, and out of its ruins, was built a little church—that of St. Margaret, since demolished. Many of the more prominent families settled in Berlin (D. Kaufmann, "Die Letzte Vertreibung der Juden aus Wien und Niederösterreich," Budapest, 1889; G. Wolf, "Die Juden in der Leopoldstadt im 17. Jahrhundert in Wien," Vienna, 1864). Vienna only too soon regretted the expulsion of the Jews. 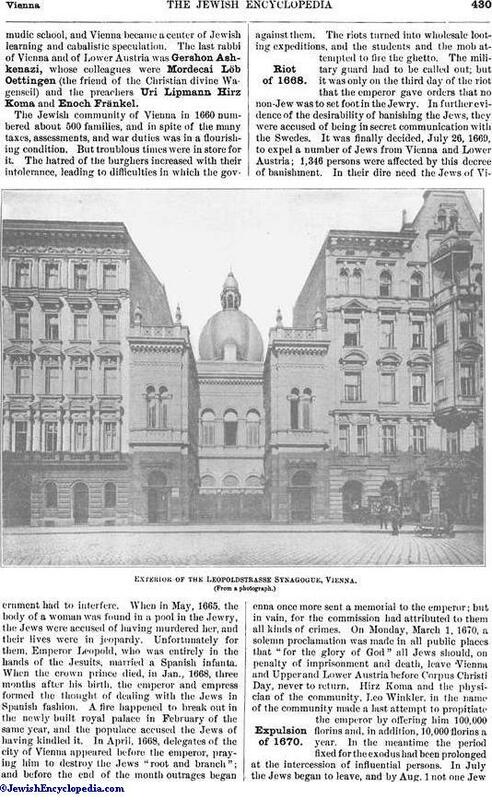 The deficit in the state tax amounted, according to the report of the royal exchequer, to 40,000 florins a year; the "Landstände" also reported a loss of 20,000 florins owing to the departure of the Jews. The citizens of Vienna, who had undertaken to pay the yearly Jews' tax of 14,000 florins, could hardly pay their own taxes. 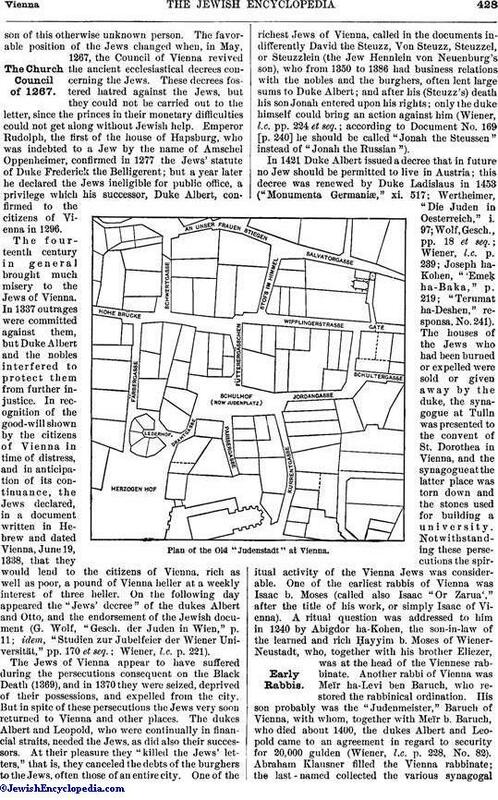 At a conference held in Wischaw, Moravia, Sept. 26, 1673, between representatives of the government and of the Jews it was agreed that 250 Jewish families might return to Vienna and occupy fifty business places in the inner city on payment of 300,000 florins and the former yearly tax of 10,000 florins. In view of the hopelessly depleted treasury, the royal exchequer considered this offer a "remarkable piece of good fortune," and on Feb. 28, 1675, the agreement was ratified; soon thereafter several Jews returned to Vienna. Samson Wertheimer, who, with his partner Samuel Oppenheimer, had rendered important services to the state, returned to the city in 1684, the first as a member of the imperial household, the second as his assistant. But the hatred of the populace against the Jews was as bitter as it had been before the expulsion, leading to frequent riots, and, as in 1705 and 1710, to repeated demands for their banishment. Gradually more families settled there: the Schlesingers; Marcus and Meyer Hirschel, who contributed 150,000 florins to the building fund of the Church of St. Charles Borromeo; the Arnsteins and Eskeles; the Leidesdorfers; Diego d'Aguilar; and many others. In 1753 there were 700 Jews in Vienna, who paid a yearly toleration tax amounting to 14,000 gulden. The plan, proposed repeatedly, to confine the Jews to a ghetto was not carried out; but they were huddled together in houses in certain streets, only a few court Jews being permitted to live among Christians. The precarious position of the Jews was in a way improved by the "Jews' decree" of May 5, 1764, which permitted any Jew who could prove that he possessed a certain sum of ready money and "acceptable" papers, or that he had established a factory, etc., to live in Vienna. According to this decree no Jew could buy a house; a married Jew had to let his beard grow, that he might be readily distinguished; and no synagogue or other place for common worship was permitted. The empress Maria Theresa, who in her unbounded hatred of the Jews could conceive of "no greater pest for the state than this nation," was always considering how to "diminish the Jews; by no means to increase them." (From a photograph. )Under Joseph II. Emperor Joseph II. also did not wish to favor the Jews or increase their numbers in his dominions; but he was at least the first Austrian ruler to recognize the Jew as a human being. The much-praised Edict of Toleration, published Jan. 2, 1782, permitted the Jews to learn all kinds of trades (without, however, granting the right to hold a master's certificate) and to lend money on real estate, though they were not permitted to acquire any. The tolerated Jew—that is, the one who paid protection or toleration money—could live with his family wherever he chose in Vienna. Foreign Jews could sell their goods at the fairs, but could remain in Vienna no longer than was necessary to finish their business. All laws compelling differentiation in attire, as well as the prohibition against visiting public places of amusement, were repealed. The sixty-five families living in Vienna in 1784 were not allowed to form a congregation or to have a synagogue. In Vienna there were established at that time a Jewish physician (Samuel B. Oppenheimer), a Jewish lawyer (A. Joel), and a Jewish dramatist (David Benedict Arnsteiner). In 1788 Emperor Joseph decreed that the Jews were liable to military service, excepting only those of Vienna who were "protected." Under Leopold II. the status of the Jews remained the same. He instituted the "Collectentaxe," a toll levied upon every Jew who went to Vienna. In spite of the harsh conditions under which they were compelled to live, there were even then Jews and Jewesses in Vienna who were held in high esteem for their culture and wealth. The salons of Fanny von Arnstein, wife of the banker Nathan von Arnstein, and of her sister Cecilia von Eskeles, wife of Bernhard von Eskeles, were at the time of the Congress of Vienna attended by princes and nobles, statesmen and high civic dignitaries, scholars and artists. 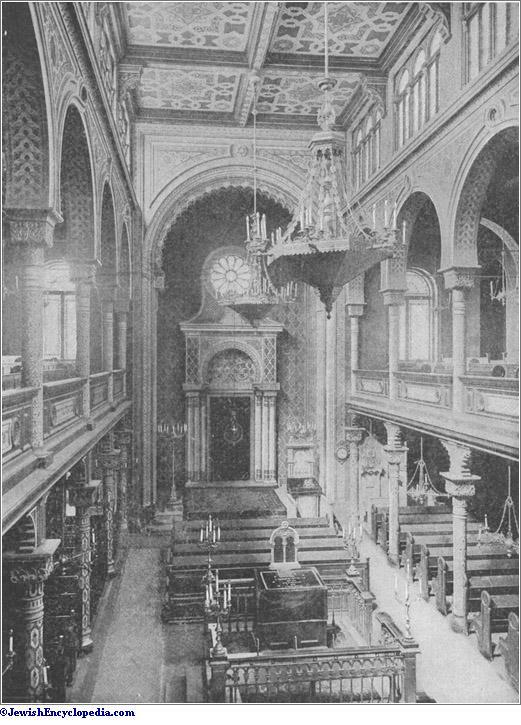 After several unsuccessful petitions, the Jews of Vienna were allowed, in 1811, to fit up a "Betstube" (room for prayers) in a house they had bought on the old Dempfingerhof; twelve years later a synagogue was built, due to the efforts of M. L. Biedermann, I. L. von Hoffmannsthal, Joseph von Wertheimstein, and others, and Isaac N. Mannheimer was called as preacher and teacher of religion, and Salomon Sulzer as cantor. 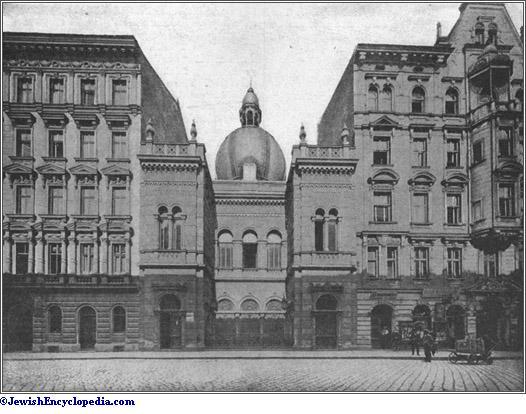 The Jews of Vienna now possessed a synagogue, a hospital which had been fitted up in the eighteenth century, and a school of religion; the teachers in the last-named were Mannheimer, J. L. Saalschütz, Leopold Breuer, and Gershon Wolf. 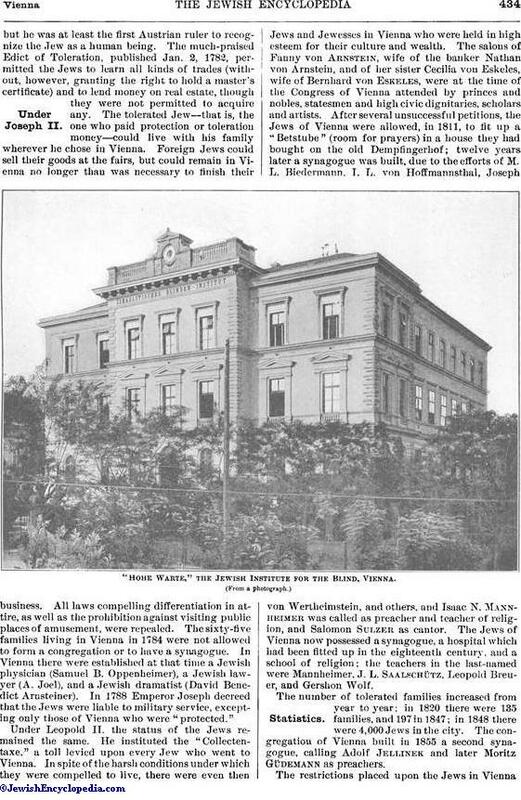 "Hohe Warte," the Jewish Institute for the Blind, Vienna. The number of tolerated families increased from year to year; in 1820 there were 135 families, and 197 in 1847; in 1848 there were 4,000 Jews in the city. 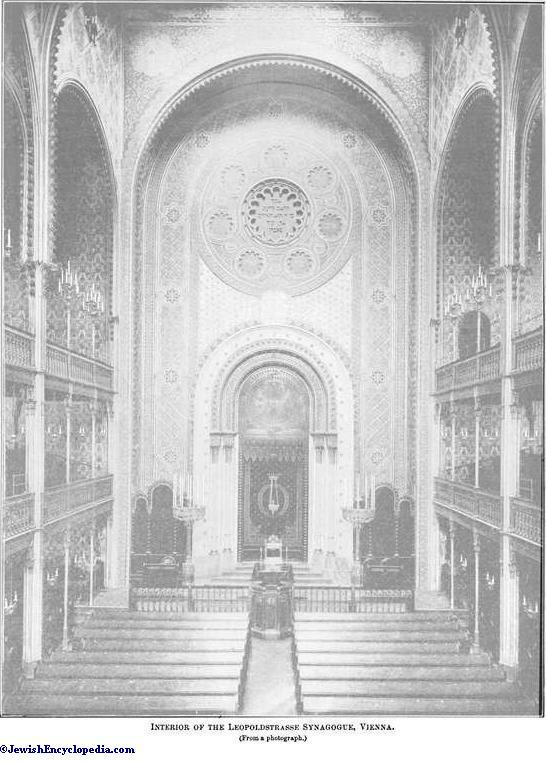 The congregation of Vienna built in 1855 a second synagogue, calling Adolf Jellinek and later Moritz Güdemann as preachers. 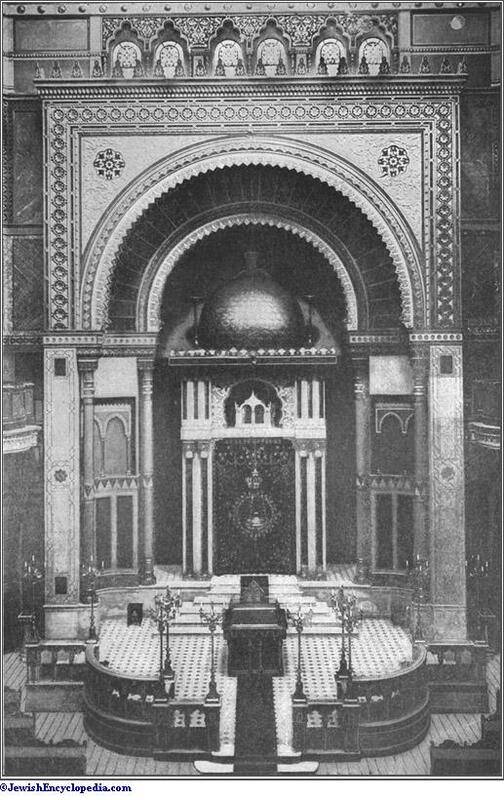 Interior of the "Turkish Temple" at Vienna. The restrictions placed upon the Jews in Vienna continued under Emperor Ferdinand. In 1846, the year in which the medieval Oath More Judaico was repealed, the representatives of the community of Vienna sent a petition to the emperor praying for a betterment of their condition; this petition was indorsed by the magistracy and the government, but it was not acted upon. Then came the Vienna revolution of March, 1848, during which the resolute Adolf Fischhof distinguished himself. The constitution of March 4, 1849, which recognized the equal rights of all citizens, regardless of creed, was repealed Dec. 31, 1851. 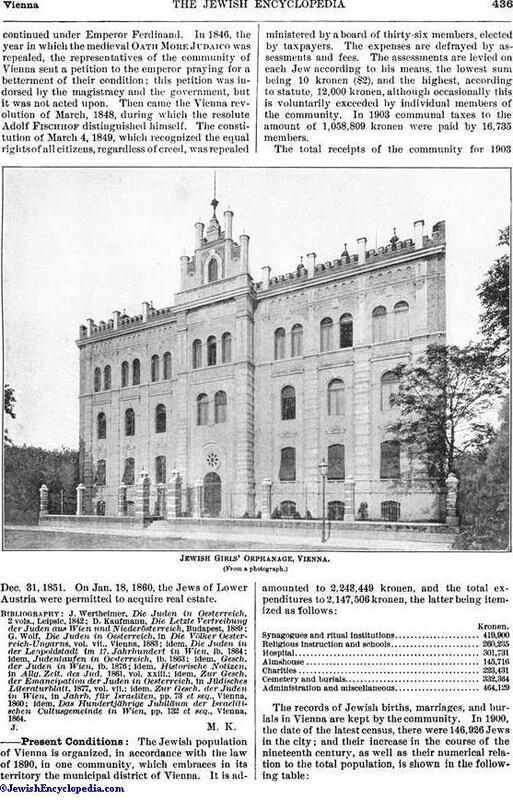 On Jan. 18, 1860, the Jews of Lower Austria were permitted to acquire real estate. idem, Das Hundertjährige Jubiläum der Israelitischen Cultusgemeinde in Wien, pp. 132 et seq., Vienna, 1864. The Jewish population of Vienna is organized, in accordance with the law of 1890, in one community, which embraces in its territory the municipal district of Vienna. It is administered by a board of thirty-six members, elected by taxpayers. The expenses are defrayed by assessments and fees. The assessments are levied on each Jew according to his means, the lowest sum being 10 kronen ($2), and the highest, according to statute, 12,000 kronen, although occasionally this is voluntarily exceeded by individual members of the community. In 1903 communal taxes to the amount of 1,058,809 kronen were paid by 16,735 members. The most important growth of the Jewish population, according to this table, was between the years 1830 and 1856, and between 1880 and 1890, the former being explained by the repeal, in 1848, of the law restricting Jewish residence in the city, and the latter by the annexation of suburban communities to the city. While the first of these extraordinary increases in number marks an actual rise in percentage, the second is a decrease in this respect, since the proportion of Jews in the nine incorporated suburbs was far lower than in the ten old districts. It is clear from this table that the increase in the Jewish population is relatively less than among the other inhabitants, although a hopeful feature is the small proportion of deaths, which may be due to a more rational mode of life among the Jews. A proof of their unfavorable political situation in Austria is afforded by the large number of conversions to Christianity, which amounted to 559 in 1900, and 617 in 1904. The community provides for daily public worship in five synagogues erected and maintained by it. In addition to these synagogues, Vienna contains a large number of synagogal associations, which have their own places of worship and are subventioned in great part by the community. On the high festivals temporary synagogues are opened to meet the extra demands. 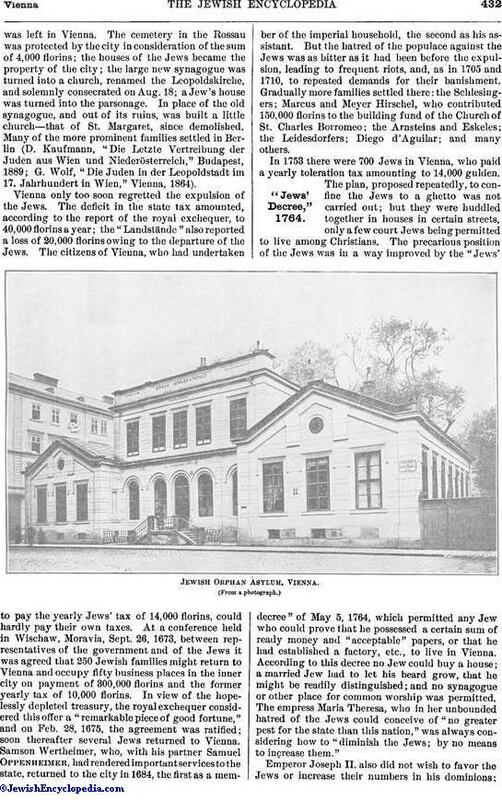 The permanent synagogues of Vienna provide accommodations for about 7,000 men and 5,600 women. 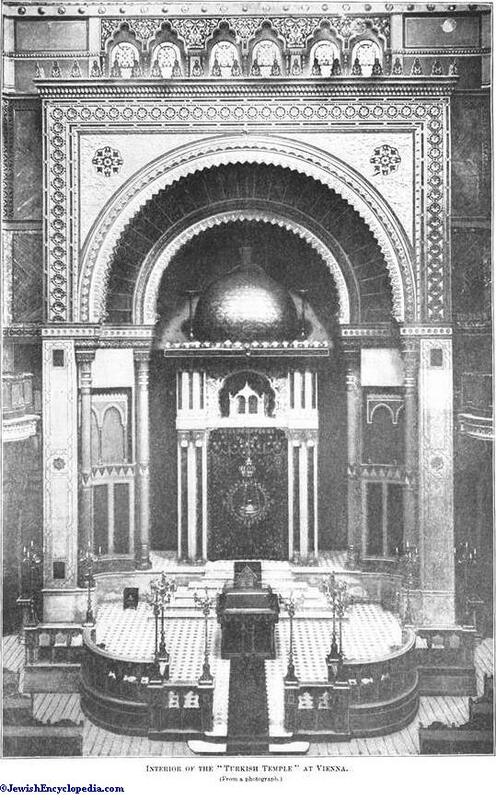 The liturgy used in the synagogues of the community, and in the majority of those associations mentioned above, is that introduced by I. N. Mannheimer and Salomon Sulzer; but in the Grosse Schiffgasse ('Adat Yisrael) synagogue, and in almost all the smaller ones, the old ritual is followed, and in the place of worship of the Turkish Jews (in the second district, Zirkusgasse), who form a community of their own, the Sephardic ritual is adhered to. The sheḥiṭah and the sale of kasher meat are under the supervision of the rabbinate of the community of Vienna, and in some stalls the sales are made under the special control of the Orthodox community 'Adat Yisrael. There is also a miḳweh. Religious instruction forms a part of the curriculum of the public schools of the lower and intermediate grades; the community provides for it entirely in the primary schools, while in the gymnasiums and real-schools, where the teachers are appointed and salaried by the state, it is supervised by inspectors commissioned by the community. In the primary schools the expenses of this instruction are borne by the community, with the aid of a fund contributed by the state in accordance with the law, although this covers only a small part of the actual disbursements; but in the secondary schools the entire expense of religious instruction falls on the state. Two hours weekly are allotted to this instruction in the curriculum, but the community maintains or subventions Hebrew schools for those who desire to acquire a more thorough knowledge of Bible and Talmud, while the large and valuable library of the Jewish community affords a wealth of material for students. The public schools of Vienna are non-sectarian, but the ruling majority have endeavored, partly with success, to enforce a sectarian division by evading the existing laws. 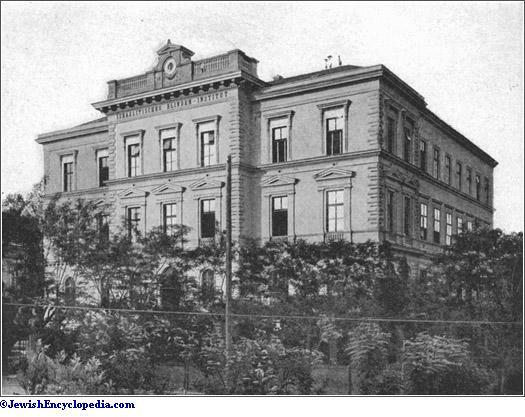 The chief institutions of Jewish learning in Vienna are as follows: (1) the Israelitisch-Theologische Lehranstalt, founded in 1893 by the society for the establishment and maintenance of a Jewish theological institute in Vienna; (2) the Talmud Torah, founded in 1854, with an average attendance of 240; (3) the general Austro-Jewish institute for deaf-mutes, founded in 1853, with an average of 92 pupils and an annual expenditure of about 108,000 kronen; (4) the Jewish institute for the blind, founded in 1870, with an average of 60 pupils, and an annual expenditure of about 75,000 kronen; and (5) the Jewish kinder-garten, founded in 1843, with an average of 330 children, and an annual expenditure of about 15,000 kronen. 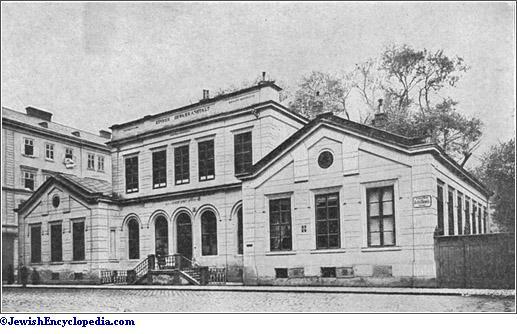 In 1900 a Jewish atheneum was established, in which evening lectures on various subjects are given to large Jewish audiences, composed especially of the poorer classes. Vienna is also the home office of the Baron de Hirsch fund for the promotion of popular education in Galicia and Bukowina and the seat of the Zionist Actions Comité. 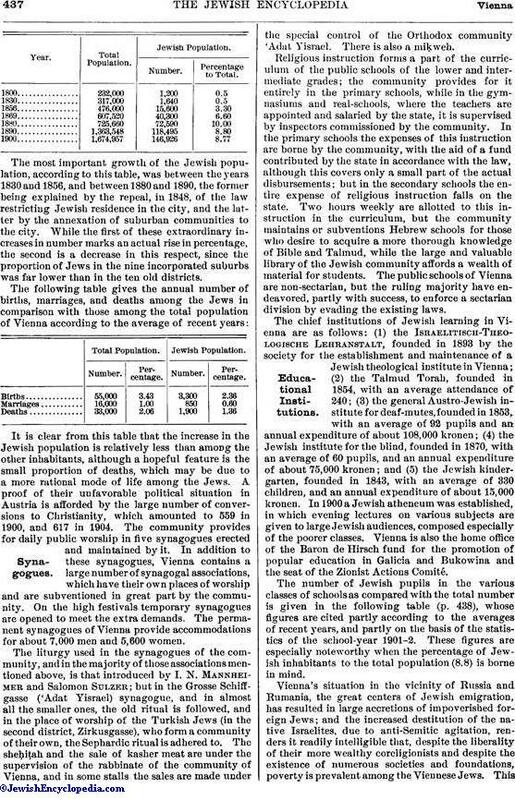 The number of Jewish pupils in the various classes of schools as compared with the total number is given in the following table (p. 438), whose figures are cited partly according to the averages of recent years, and partly on the basis of the statistics of the school-year 1901-2. These figures are especially noteworthy when the percentage of Jewish inhabitants to the total population (8.8) is borne in mind. 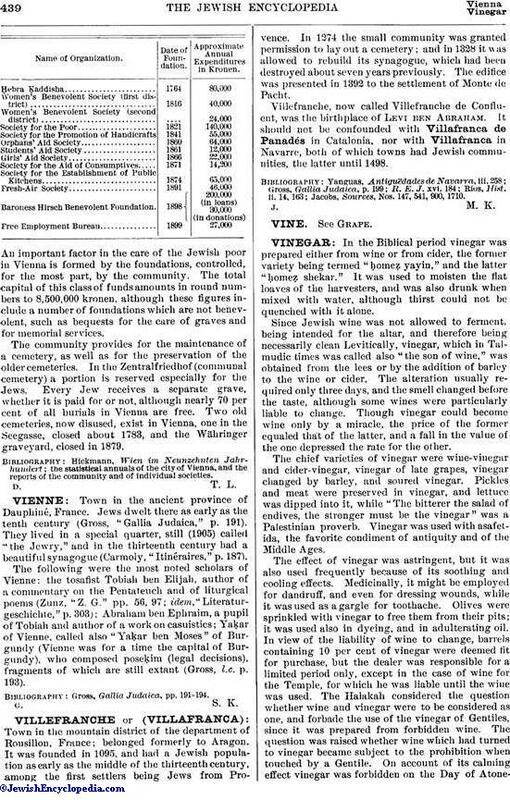 Vienna's situation in the vicinity of Russia and Rumania, the great centers of Jewish emigration, has resulted in large accretions of impoverished foreign Jews; and the increased destitution of the native Israelites, due to anti-Semitic agitation, renders it readily intelligible that, despite the liberality of their more wealthy coreligionists and despite the existence of numerous societies and foundations, poverty is prevalent among the Viennese Jews. Thisis intensified by an unfortunate division of forces among individual associations. The community maintains a number of charities. A hospital was founded by the Vienna branch of the house of Rothschild, with 170 beds and an annual expenditure of about 300,000 kronen; it has recently been endowed by Baron Nathaniel Rothschild with 2,000,000 kronen to render all its space available. A home for the aged and infirm, with 248 beds, was founded in honor of the fiftieth anniversary of the emperor's accession to the throne; the cost of its maintenance is about 145,000 kronen annually. The following are devoted exclusively to the care of the poor: the asylum for orphan girls (60 inmates; annual expenditure about 40,000 kronen); the Lea Merores asylum for orphan girls (50 inmates; opened in 1904); the Baron Springer asylum for orphan boys (founded 1890; 50 inmates); the employment bureau for girls (accommodations for 189) and the employment bureau for boys (accommodations for 36), both institutions maintained by the Theresien Kreuzer Verein; the employment bureau for female apprentices (accommodations for 30), maintained by the Leopoldstadt Ladies' Club; the home for male apprentices, maintained by the Society for the Promotion of Handicrafts Among the Native Jews. Various forms of charitable work are also carried on by a large number of Jewish societies, of which the most important are given in the table on page 439. Part of Old Cemetery at Vienna. Vienna is the seat of the following societies, which deserve mention here, although their sphere of activity is not restricted to this city, or else is not confined to philanthropic objects: the Israelitische, Allianz (founded 1872); the Oester-Reichisch-Israelitische Union (founded 1885); the Allgemeine Oesterreichisch-Israelitische Bund; the Association for the Aid of the Needy Jewish Population of Galicia; and the Baroness Hirsch Foundation for the Assistance of Boys and Girls in Austria. Approximate Annual Expenditures in Kronen. An important factor in the care of the Jewish poor in Vienna is formed by the foundations, controlled, for the most part, by the community. The total capital of this class of funds amounts in round numbers to 8,500,000 kronen, although these figures include a number of foundations which are not benevolent, such as bequests for the care of graves and for memorial services. The community provides for the maintenance of a cemetery, as well as for the preservation of the older cemeteries. In the Zentralfriedhof (communal cemetery) a portion is reserved especially for the Jews. Every Jew receives a separate grave, whether it is paid for or not, although nearly 70 per cent of all burials in Vienna are free. 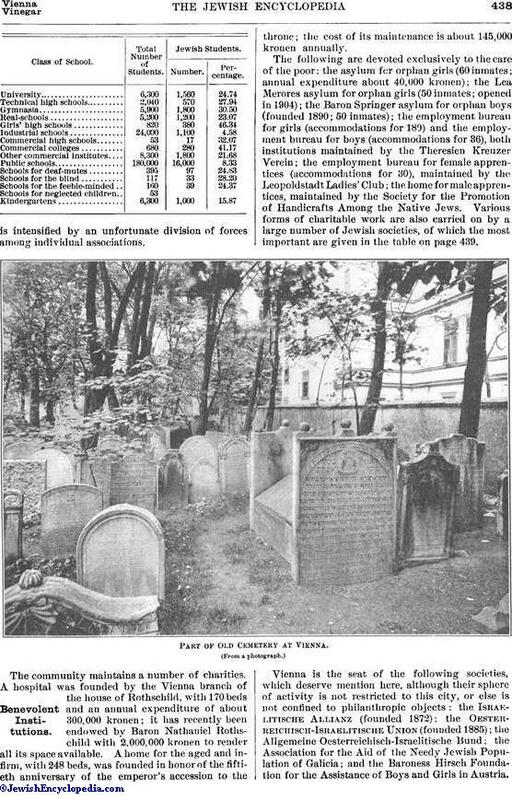 Two old cemeteries, now disused, exist in Vienna, one in the Seegasse, closed about 1783, and the Währinger graveyard, closed in 1879.
the statistical annuals of the city of Vienna, and the reports of the community and of individual societies.